For an additional article touching on my creative process, click here. What originally brought me to Reiki was the buzzing I felt in the palms of my hands each time I went into meditation. Though unsure as to the nature of those pulsations, I was drawn to study some form of vibrational healing and was immediately put in contact with a Reiki Master. After my initial attunements in 1998, I was able to “hear” the inaudible Reiki vibration as a gentle, high tone. After more recent attunements, my perception broadened into a full body experience, often akin to being bathed in the deliciously expanding sounds of a gong. Beginning with my immersion in the Reiki vibration, I found I could perceive the vibrational characteristics of other things as well: each of my large collection of homeopathic and flower remedies, supplements, gemstones, actually anything. The concept brought forth by ancient teachings, as well as Quantom Physics, that the world of form is comprised of vibration felt natural to me. With an intention to create artworks that both contain and convey the energy signature of a given theme (compassion, love, hope, etc. ), I developed a unique studio practice. The use of breath, sound, music, movement, dance, writing, prayer and meditation support me in the embodiment of a project’s theme. Somatic cues act as a touchstone during the development of the artwork; when in doubt concerning my direction, I refer back to that bodily felt-sense to ensure that the artwork is in resonance with the theme. After collecting fresh water from a mountain stream near my home in Willow, NY, I poured it into a transparent glass jar. I then attached an inward facing label with the word “Reiki” written in both Romanization and Kanji, and placed the jar in a patch of sunlight. According to Masaru Emoto, this method is capable of structuring the water molecules with the vibration of Reiki. To make doubly sure, I held the jar of water in my hands while enjoying the familiar Reiki pulsations. The clear water was used first to write the Reiki symbols in large, invisible characters onto the still blank sheet of watercolor paper. Later, the water served to dilute the gouache with which I painted the Reiki mandala. Creating the layout of countless petals was grueling. 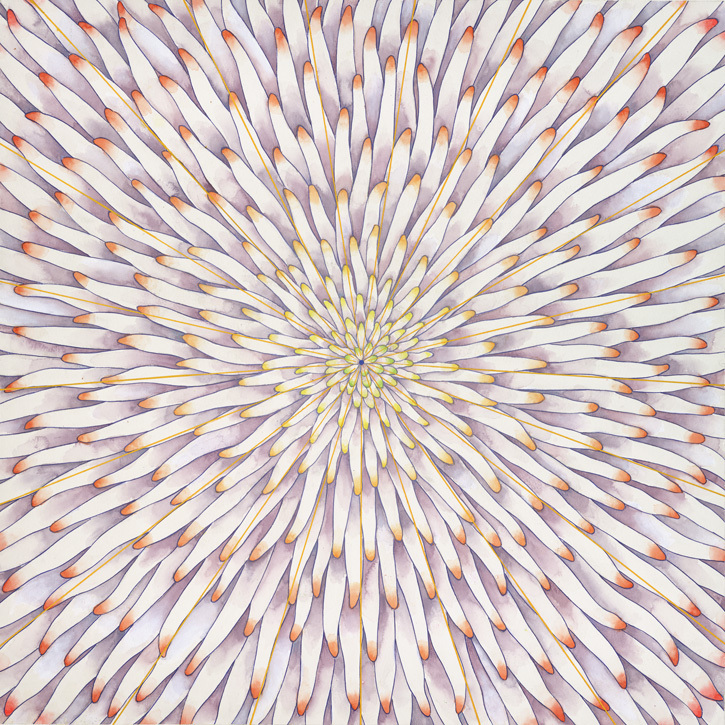 I had envisioned the mandala as a chrysanthemum but none of the photographs I found were exactly right. Instead, I turned to a technique of ‘seeing what is not yet there.’ I would stare at a spot on the blank page, waiting until a shape presented itself and then had only to trace its contours. Every petal length, thickness and curve was checked and double-checked with muscle testing. (I would ask yes-or-no questions and then test muscle strength in the fingers of one hand. A strong response indicated a ‘yes’,’ while a weak response indicated a ‘no.’) The difficulty was in maintaining focus and accuracy for more than a few minutes! Periodically, I would pause and give myself a brief Reiki treatment to ensure that I was still “humming the Reiki tune.” I was a bit surprised that the final image resembles a sea anemone as much as it does a chrysanthemum; following guidance often leads to surprising outcomes! A similar discipline was utilized in mixing and placing the subtle color variations, which create a slight gradation of lighter shadows in the center and darker ones toward the periphery. Several full size color sketches were completed before the rhythms began singing the Reiki vibration. At the center point of the mandala is the ‘bindu,” which Wikipedia aptly defines as “the point at which begins creation and the point at which the one becomes the many.” It is also “the sacred symbol of the cosmos in its unmanifested state.” From it, twenty-one golden radiating lines emerge, representing the twenty-one days Reiki founder, Mikao Usui, sat in meditation. As with many of my mandalas, the viewer’s eye is led both outward in endless expansion and infinitely inward toward the center. By gazing with a soft focus at the centerpoint, this mandala gives the viewer a visceral experience of primordial consciousness aka the Infinite Field. If you have received Reiki attunement, you are familiar with this vibration as sensed by your own body. Or, perhaps, you have experienced the Reiki connection in a healing session. I encourage Reiki practitioners to use this image to support their practice. Try using the soft focus gaze while giving yourself a session, or while offering Reiki to another. It works extremely well if hung in a treatment room or when used as a focal point while doing distant healing. Thank you for sharing your process. Your work is beautiful and serene. this is an amazing process. I have found creative energies in reiki as well but this is fascinating. thank you for sharing. thank-you for your comment, carolyn. there’s another reiki article on this blogsite about the focus group sponsored by The Reiki Digest to determine whether working with the mandala would enhance reiki practice. for that one, click on the research tab.